Musicians, Do You Want To Start Or Expand Your Music Career? 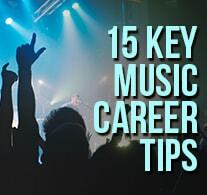 Whether you are just starting out or are a professional musician and want to take your music career to the next level, you need the 15 essential (and free) music career tips. How to get started now to build a highly successful career in the music industry. How to transform your fans into SUPER FANS. How to make key connections in the music industry and what to do once you have them. How to improve your live shows. How to massively multiply everything you are already doing to build your career in music. How to easily make your live shows and touring much more profitable. Get started now with the 15 free music business tips that WILL help you develop your music career. Simply enter your name and email, then click the "Give Me Access Now" button to enter. All of your information is always kept 100% private and confidential.